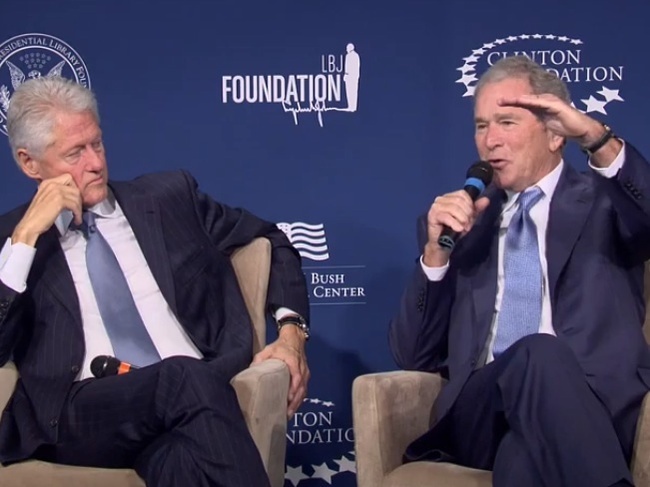 George W. Bush’s face creases into a broad grin and his eyes twinkle at mention of Bill Clinton, the man he calls his “brother from another mother”. He is leaning back in his leather chair, his feet planted on the desk in his office in a Bank of Texas high-rise building overlooking the Dallas skyline. Amid the family photographs behind him rest two Bibles. Bush has just finished a childhood anecdote about how his mother once “washed my mouth out with soap” after she caught him urinating in their garden hedge. That tale came hot on the heels of one about his family once sharing a bathroom with “women of the night” in an early home. “I like to try to get people to laugh,”he chuckles. It is hard to imagine him sharing a bawdy joke with Barack Obama; indeed, the pair barely exchange more than a pleasantry from one year to the next. But Clinton, he intimates, is a kindred soul. While Clinton campaigned across the country for Democrats in the recent mid-term elections, Bush stays largely out of public view. He took up painting nearly three years ago and spends up to five hours a day at the easel. He has had surgery for “two new knees” but still goes on long bike rides along Texas trails and spends a week a month at his ranch. He also works quietly with military veterans who have lost limbs or suffer from post-traumatic stress disorder. He is an avid reader, though he peppers his conversation with self-deprecating quips about his infamous linguistic travails. I first interviewed Bush on his campaign plane in 2000. He was more tightly wound then but with the same roguish sense of humour. In his eight years in the White House he often seemed weighed down by the burdens of office. Now, there is a lightness about him. He is currently reading Andrew Roberts’s biography of Napoleon and is intrigued by the political prospects of Boris Johnson. “The mayor of London has just written a book about Churchill. He sounds kind of like Churchill, doesn’t he? Very strong use of words. But Bush, the 43rd president of the United States, has just managed to pen a highly readable and, at points, very moving book about his father George HW Bush, the 41st president, who is now 90, wheelchair-bound and in failing health. At a gathering of the Bush clan at Walker’s Point in Kennebunkport, Maine, for a family wedding in September, 41 and 43 broke off from the celebrations to ring 42 — Clinton, who occupied the Oval Office during the Democratic interregnum between the Republican administrations of the two Bushes. The friendship is remarkable on a number of levels. Clinton defeated Bush Sr in 1992 after portraying him as feeble and out of touch. Bush Jr still describes that loss as one of the most painful moments of his and his father’s lives. Eight years later, he beat Clinton’s vice-president, Al Gore, in large part by promising to restore “honour and integrity” to the presidency — an allusion to the Monica Lewinsky scandal. He even joked on a comedy show about needing to give “one heck of a scrubbing” to the Oval Office, the scene of sexual encounters between Clinton and the intern. The rivalry between the two political dynasties is far from over. In the next few weeks, Bush’s younger brother, Jeb, will decide whether to run for the White House. Both 41 and 43 hope fervently he will become “45”. If Jeb survives a tough Republican primary battle, he will almost certainly face Bill’s wife, Hillary, in the general election in two years’ time. Far from being an obstacle to their unlikely friendship, the dynastic rivalry is a source of banter between George W Bush and Bill Clinton. “He obviously keeps his counsel on Hillary but I like to needle him about how he’d be an interesting first spouse,” says Bush. It is almost six years since he left office with an approval rating of 22%, the lowest of an outgoing president since polling began more than 70 years earlier. His book, 41: A Portrait of My Father, is intended to add weight to a recent reassessment of Bush Sr’s one-term presidency that has seen his foreign policy realism and courtly moderation praised by historians and even by Obama. He ruminates on how a strong bond developed between his father, whose bomber was shot down over the Pacific in 1944, and Clinton, who avoided the military draft during Vietnam. “The character of George HW Bush is such that the man who beat him ends up becoming a friend and in some ways Dad serves as a father figure,” says Bush, who points out in his book that Clinton’s father died in a car crash before he was born. Yet if Bush Sr had not lost in 1992, it is unlikely that George W would have taken a tilt at becoming governor of Texas or that Jeb would have sought the same office in Florida. In the event, the elder son — he is seven years older than Jeb — won in Texas while the younger lost in Florida. Their parents issued a statement saying that “the joy is in Texas, but our hearts are in Florida” — fuelling a belief that Jeb was the chosen son whom they had viewed as destined for the White House. Although Jeb was elected in Florida in 1998 and re-elected in 2002, it was George W who was first in line for a 2000 run for the presidency. Bush dismisses as “psychobabble” the notion that he and Jeb, always regarded as more cerebral and articulate, have ever been rivals. The book is also an attempt to dispel what he insists are myths about him resenting his father. There is a scene in the Oliver Stone film W in which, as a drunken youth, Bush Jr offers to go “mano a mano” with his father after crashing his car into a rubbish bin outside his parents’ home. A frightened Jeb has to intervene. He was drunk and he did hit the bin, he admits, but the confrontation with his father is pure fiction. In fact, Bush says, his father lowered the book he was reading, took off his glasses and stared at him before putting them back on and lifting up the book, prompting a chastened W to slink away in disgrace. The Bushes are the second family in American history to have produced a father and son who became presidents. John Quincy Adams, the sixth president, was sworn in 24 years after his father, John Adams, the second, left office in 1801. Americans, he concedes, have an inbuilt aversion to any notion of a hereditary class of rulers. It is, moreover, a sentiment expressed by his mother Barbara who put it succinctly last year when she declared that “we’ve had enough Bushes”. There will be no family poll, he says, on whether Jeb should run. During the family dinner in September — also attended by siblings Neil, 59, Marvin, 58, and Doro, 55 — it wasn’t even discussed. “There’s no sitting around and, ‘OK, Jeb, now it’s your time to speak’ and ‘What do you think, Neil, should he run?’. It’s a very personal decision and only he can make it. If he were to run, we’re all in. Whatever he wants us to do, we’ll do because we love him dearly. His father nearly decided not to run for re-election in 1992 because of fears it would draw more attention to a financial scandal in which Neil had been embroiled. The main impediment to Jeb running this time is said to be his Mexican-born wife Columba’s dislike of the limelight. But if George W’s book offers a clue to Jeb’s likely decision, it could lie in the message that their father’s life is an example. He was able, George W argues, to be a remarkably loving and attentive father despite a career that saw him as a congressman, ambassador to the UN and China, CIA director, vice-president and president. The dynastic issue has been neutralised, Bush argues, by Hillary Clinton being the likely Democratic nominee. “I had to deal with it — you’re running on your daddy’s name or you wouldn’t be anybody if your name was Smith. I understand all that and Jeb does as well. But he suggests that Jeb would be able to “heal” the country and in the book he laments that the gains achieved by his 2007 troop surge in Iraq had been squandered because of “subsequent developments and decisions” that allowed Isis to sweep in from Syria. Obama has faced fierce criticism for what many Republicans see as a disengagement from the world and weakness in the face of adversaries such as President Vladimir Putin of Russia and President Bashar al-Assad of Syria. Bush is worried about a growth in isolationist sentiment in America. One of the lessons of 9/11 is that “the human condition elsewhere does matter to our security”. While there are polls saying Americans “are tired of this and tired of that”, a president’s job, he suggests, is “to explain why”. On his desk is a wooden box with the words “Someone Must Lead” carved in the lid. Talking about his impression that Putin was “stuck in the Cold War”, he observes that the former KGB colonel “probes for weakness, it seems to me, and takes advantage of vacuums”. Bush’s main passion these days is painting. After the interview he eagerly flips through his iPhone to show me photographs of his latest works. It was Churchill’s essay Painting as a Pastime that inspired him to take up his brushes, in part to avoid the kind of “despondency” that the former wartime prime minister experienced after his 1945 election defeat. Implicit in Bush’s desire for his father’s presidency to be reappraised is the hope that his own controversial tenure will one day be judged less sharply. To an extent, that process is already under way after six years of Obama. In the meantime, Bush’s greatest blessing, he says, is being the recipient of unconditional love from his father. They are an emotional family and neither man is afraid to cry or tell the other: “I love you.” Sometimes, they’ll say, “I love you more than tongue can tell,” a phrase used by Bush’s sister Robin, two years younger than him, who died of leukaemia at the age of three.